Relationships are dynamic and require investment. You cannot expect to have a close relationship with your spouse or kids if you do not spend time with them. Specialists talk about quality time vs. quantity time. Most say quality time is what matters most. I would argue that you need to have both. It is hard to think of giving God 1 minute a day and expect to grow even if that is a quality, highly-focused minute! 7 Don’t be deceived. God is not mocked, for whatever a man sows, that he will also reap. 8 For he who sows to his own flesh will from the flesh reap corruption. But he who sows to the Spirit will from the Spirit reap eternal life. 9 Let us not be weary in doing good, for we will reap in due season, if we don’t give up. 10 So then, as we have opportunity, let’s do what is good toward all men, and especially toward those who are of the household of the faith. Sowing to the Spirit sounds mystical. How do you plant seeds into the Spirit? How do you cultivate a garden of Spirit? What does that fruit look like? It seems pretty clear that I have a choice to make every day as to my orientation. I choose to acknowledge my God and His lordship in my life or I don't. I choose surrender or I won't. Earlier in Galatians Paul reminded the people that he had been crucified with Christ and that he no longer lived but Christ was now living His life in Paul. Paul's calling was to trust in the Lord and live by faith (Gal. 2:20). He invited them to live like this. The Holy Spirit invited us to live like this as well. 1. Being in His Word - read what is important to Him. Listen for His voice in the pages. 2. Being in prayer - talk with Him but listen too. 3. Being obedient to His twinge - you know, the Holy Spirit twinge you feel when you are about to do something you shouldn't? When you get the twinge, obey it! Listen to Him and obey. This is a relationship with a PERSON not a power. The Holy Spirit can be grieved and quenched by our choices. Be careful to seek Him out and obey Him. 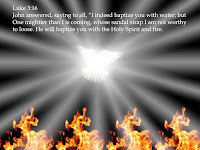 Are you willing to take the time necessary to know God the Holy Spirit? Are you willing to give God your best, quality time? Talk with Him about it .... He already knows the answer anyway. Listen to Holy Spirit Rain Down in the DevoLink Worship Center.